Suspecting and Treating Femoral Stress Fractures. 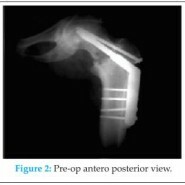 Central Institute of Orthopaedics, VMMC & Safdarjung Hospital,New Delhi, India. Introduction: Stress fractures occur in individuals in whom repetitive strenuous muscle and tendon force act on bone; that have not adapted to such forces. Under a constant load, osteoclast resorption and osteoblastic reconstruction of bone are in equilibrium, resulting in normal remodeling. If loading increases, additional bone resorption occurs. Increased osteoclastic activity at sites of stress may cause local weakening and predispose to micro damage. If allowed to progress, such micro fractures may progress to complete fractures. Case Report: A 30-year-old man presented with right thigh pain for 3 days without any history of significant trauma. He was a military recruit with history of running 5 miles a day for last 12 years and was running 20 miles a day for last 5 days before he developed pain. Examination revealed pain to palpation along the proximal medial and lateral right thigh. Range of motion was painful and limited. Radiograph of right hip showed fracture line in intertrochanteric region of femur. Conclusion: Here we have reported a case of stress fracture of proximal femur in intertrochanteric region which to our knowledge has not been reported in the literature so far. This fracture is important to recognize early as there are high chances of displacement resulting in increased risk of complications. We suggest immediate anatomical reduction and stable internal fixation to prevent complications and early mobilization to decrease the morbidity. Keywords: Intertrochanteric, Osteonecorsis, Insufficiency fracture, Osteoblast, Osteoclast. Stress fractures occur in individuals in whom repetitive strenuous muscle and tendon force act on bone; that have not adapted to such forces. [1-3] Stress fractures can be subdivided into fatigue fractures, caused when normal bone is exposed to repeated abnormal stress, and insufficiency fractures, where normal stress is applied to abnormal bone. Under a constant load, osteoclast resorption and osteoblastic reconstruction of bone are in equilibrium, resulting in normal remodelling. If loading increases, additional bone resorption occurs. [5,6] Increased osteoclastic activity at sites of stress may cause local weakening and predispose to micro damage. If allowed to progress, such micro fractures may progress to complete fractures. Although stress fractures can arise at any site, the most common locations are postero-medial tibia, particularly in runners; metatarsals in runners, dancers, and military recruits; iliopubic and ischiopubic rami in military recruits, gymnasts, dancers, and soccer players; and femur in cross- country runners. Calcaneum is also a common site of involvement. [1,4] Stress fractures of the femur are usually seen in osteoporotic elderly people, but in healthy young athletes they are less common. Stress fractures of neck of femur have been reported several times in previous years. Fractures localized to the superior surface of neck of femur are termed tension fractures, and those localized to the inferior surface, compression fractures. To our knowledge, the literature contains no reports of stress fracture of proximal femur in intertrochanteric region. Here, we describe a case of stress fracture of the proximal femur in intertrochanteric region in a male military recruit. The patient was informed that data concerning the case would be submitted for publication, and he consented. A 30-year-old man presented with right thigh pain for 3 days without any history of significant trauma. He was a military recruit with history of running 5 miles a day for last 12 years and was running 20 miles a day for last 5 days before he developed pain. Examination revealed pain to palpation along the proximal medial and lateral right thigh. Range of motion was painful and limited. Radiograph of right hip showed fracture line in intertrochanteric region of femur. Presumptive diagnosis of stress fracture was made. Patient was admitted and further investigated to rule out any other pathology. All blood investigations including serum levels of calcium, phosphorus, PTH and creatinine were normal except for low 25-hydroxy vitamin d3 levels (22.4 ng/ml). 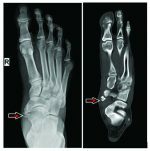 Reports of 99m-Technetium MDP bone scan, Magnetic resonance imaging (MRI) and Computed tomography (CT) were consistent with stress fracture with no other pathology. Dual- energy X- ray absorptiometry was also normal. Patient was managed by Closed reduction and internal fixation with Dynamic hip screw with anti-rotation screw. Initially patient was molilised toe touch walking with cruch support with regular follow up and at the present time patient is walking full weight wearing, no pain, without support and performing his daily routine activities and joined his duties as well. Here we have reported a case of stress fracture of proximal femur in intertrochanteric region which to our knowledge has not been reported in the literature so far. This fracture is important to recognize early as there are high chances of displacement resulting in increased risk of complications. We suggest immediate anatomical reduction and stable internal fixation to decrease the morbidity and prevent complications. 1. Kiuru MJ, Pihlajamaki HK, Ahovuo JA. Bone stress injuries. Acta Radiol. 2004;45:317-26. 2. Teitz CC, Harrington RM. Patellar stress fracture. Am J Sports Med. 1992;20:761-5. 3. Mason RW, Moore TE, Walker CW, Kathol MH. Patellar fatigue fractures. Skeletal Radiol. 1996;25:329-32. 4. Pentecost RL, Murray RA, Brindley HH. Fatigue, insufficiency, and pathologic fractures. JAMA. 1964;187:111-14. 5. Li GP, Zhang SD, Chen G, Chen H, Wang AM. Radiographic and histologic analyses of stress fractures in rabbit tibias. Am J Sports Med.1985;13:285-94. 7. Wernts JR, Lane JM. The biology of pathologic repair. In: Lane JM, Healey JH, eds. Diagnosis and management of pathologic fractures. New York: Raven Press, 1993:1- 11. 8. Knapp TP, Garrett WE. Stress fractures: general concepts. Clin Sports Med. 1997;16:339-56. 9. Fullerton LR Jr, Snowdy HA. Femoral neck stress fractures. Am J Sports Med. 1988;16:365-77. 12. Fullerton L, Snowdy H. Femoral neck stress fractures. Am J Sports Med 1988;16: 365–77. 13. DeFranco MJ, Recht M, Schils J, et al. Stress fractures of the femur in athletes. Clin Sports Med 2006;25(1):89–103. 14. Fullerton LR Jr. Femoral neck stress fractures. Sports Med 1990;9(3):192–7. 15. Johansson C, Ekenman I, Tornkvist H, et al. Stress fractures of the femoral neck in Athletes. Am J Sports Med 1990;18:524–8. 16. Lambotte A. L’intervention opératoire dans les fractues recenesetanciennes envisagée particuliérement au point de vue de l’osteosynthese avec la description des plusiers techniques nouvelles. Paris; 1907. 17. Lambotte A. Chirugieopératoire des fractures. Paris: Mason etCie; 1913.